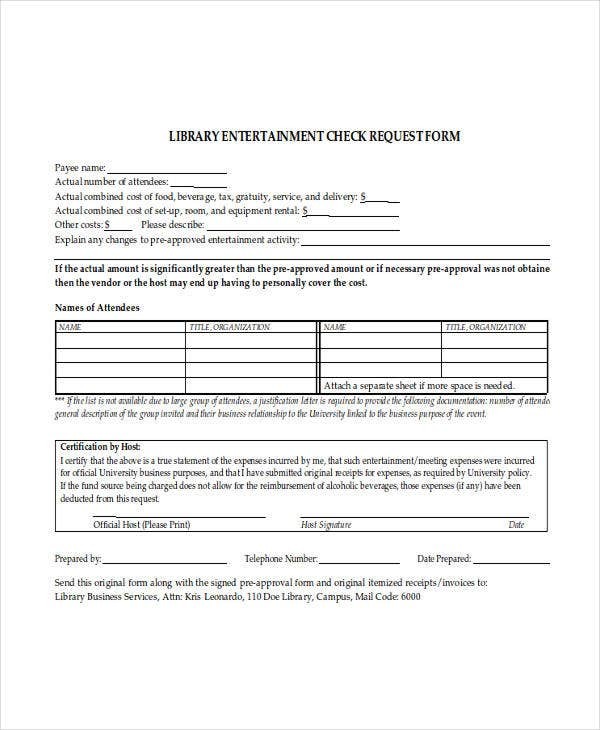 A Check Request form is a great option for initiating check transactions related to payments like subscriptions, registrations, membership dues, or for reduction of revenues, honorariums, etc. It contains all the information related to the transaction, including the date of issue, the name of the person issuing it etc. along with the concerned person’s approval. All the details in the check template should be backed up with original invoice and other necessary documents required, the failure of which will deem the form invalid. 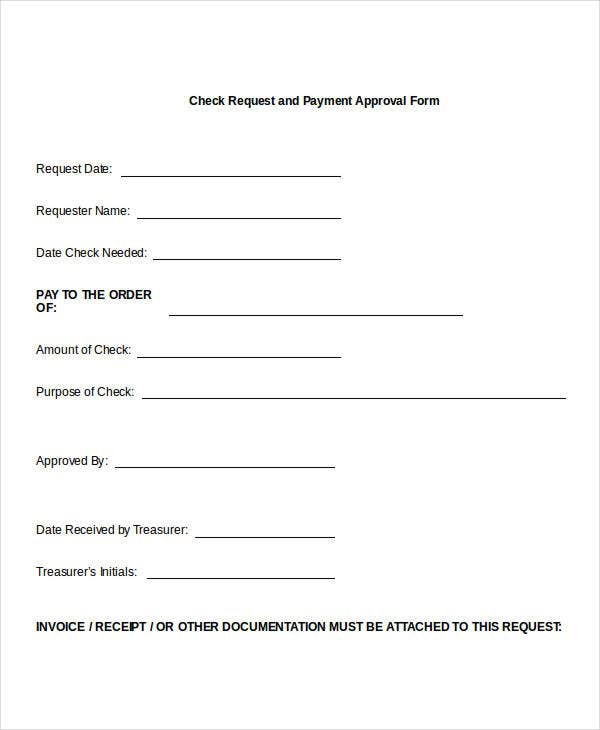 A Check request form contains all the necessary information related to payment, including the date, the name of the person requesting the payment, the one whom it will be payable to, mail id, account, the exact amount and approval along with the necessary documents and invoice. It consists of the complete details of the person payable, along with the mode of payment. A table consists of the complete list of the expenditures along with the amount and necessary description. It also consists of the dates and approval details. 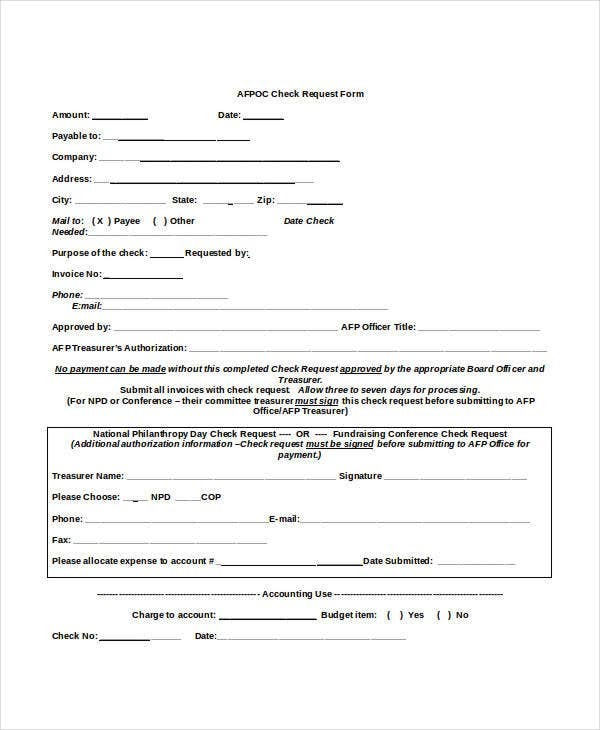 Accounts payable check request form is payable by accounts and consists of details of the vendor along with details of the person payable. Its table contains detailed information about the ledger account number, description, and the amount along with approval details. 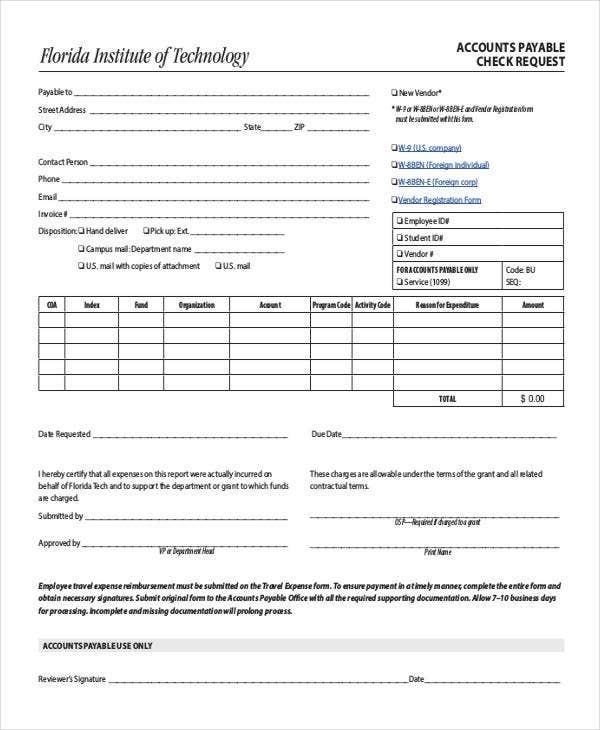 This check request form is for use in agency account and consists of details about the agency with the name and address of the person payable, dates, and approval details along with the necessary documents. 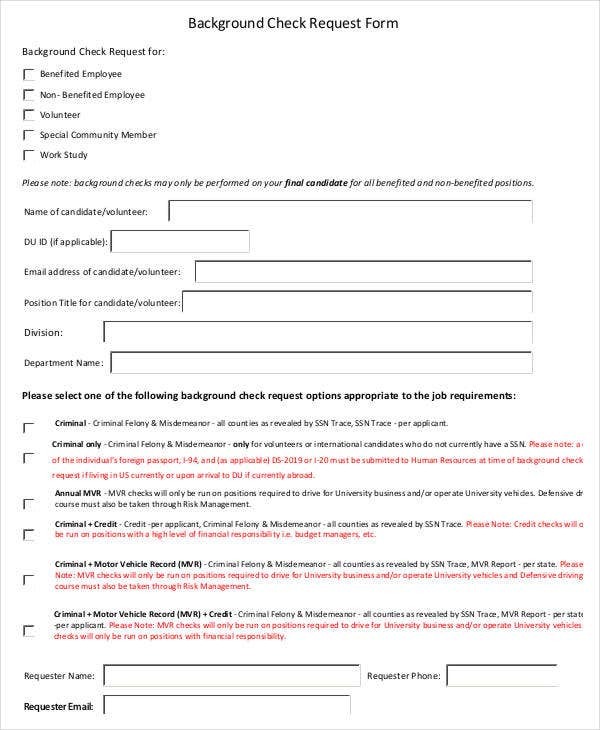 > What is the significance of the Check Request Forms? 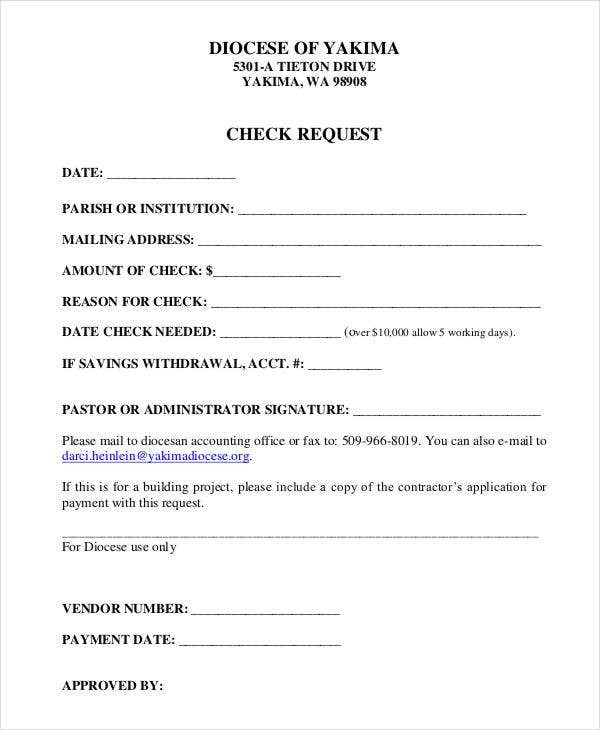 Nowadays, the check request form is the mode of payment in many cases. Any company can use it to pay the vendors or any individual or company for the services delivered. 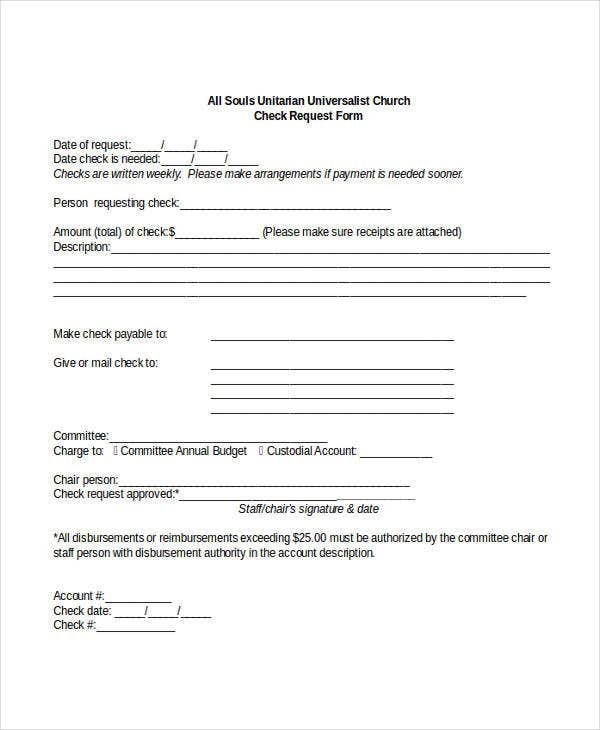 It can also be used to make minor payments like honorariums, workshops, minor supplies, one time payments, etc. 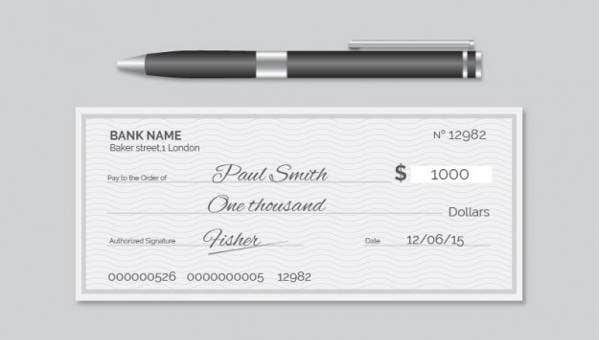 Any individual or company can make a check request and it must be backed up with the original invoice or service record which will act as a valid proof. For example, for an honorarium, the travel expenses will be reimbursed after presenting the original receipts or tickets. It is a method for initiating refunding. You can also see Sample Check Register Templates. 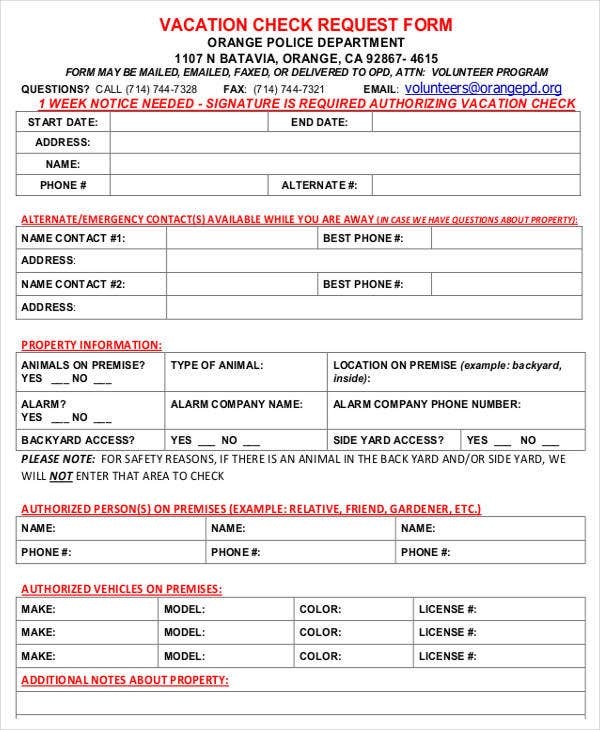 The blank check request form contains the amount details along with fields for the company name and address, the invoice number, details about the payee, the approval details of the officer, and other necessary document details. You just need to clearly mention the grounds of the payment, amount, date, and the details of the payee including the necessary documents required. 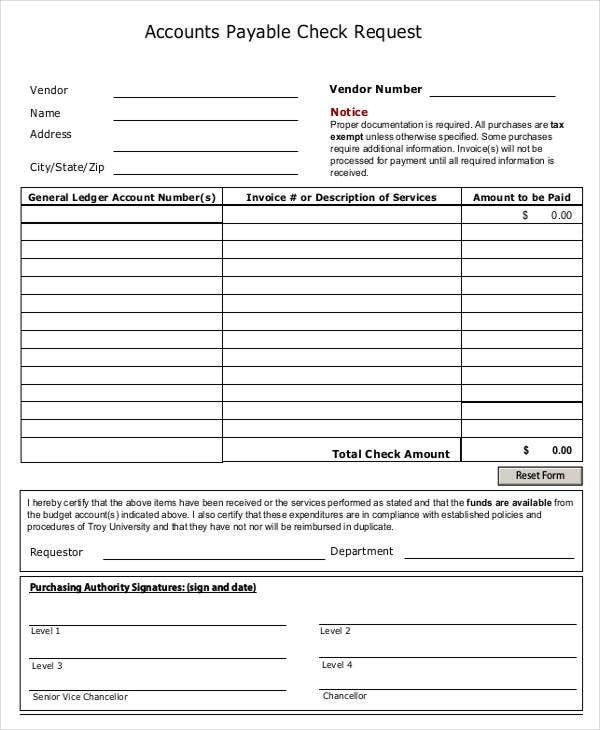 For example, for filling up a check request form for a vendor, the details of the inventory checklist should be included including the receipts. Likewise, for any payment for a short term service, the contract or the detailed agreement should be provided with the check request form. 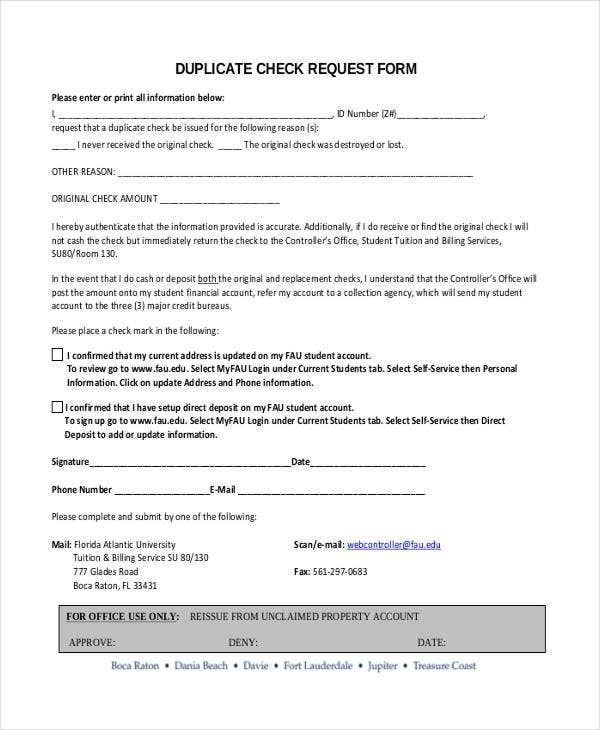 Incomplete check request forms will not be honored and may require resubmission. 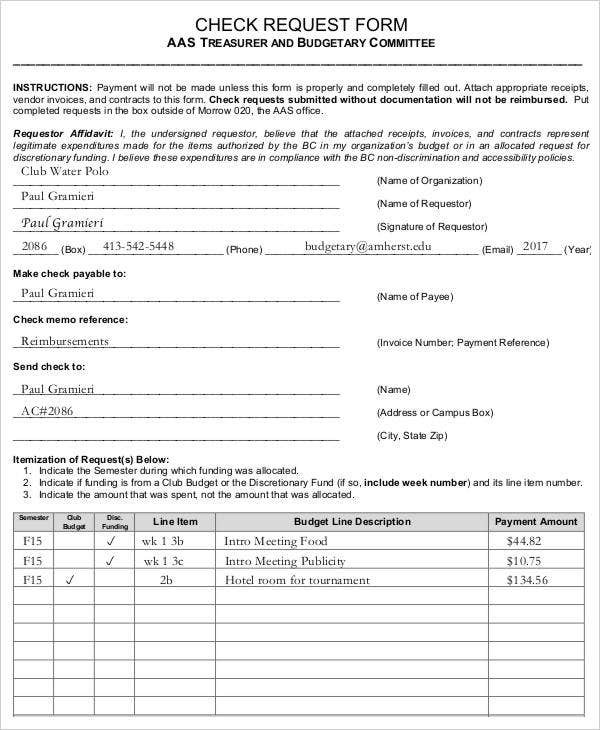 A check request form serves a wide range of functions where the payment of money or initiation of payment is required. 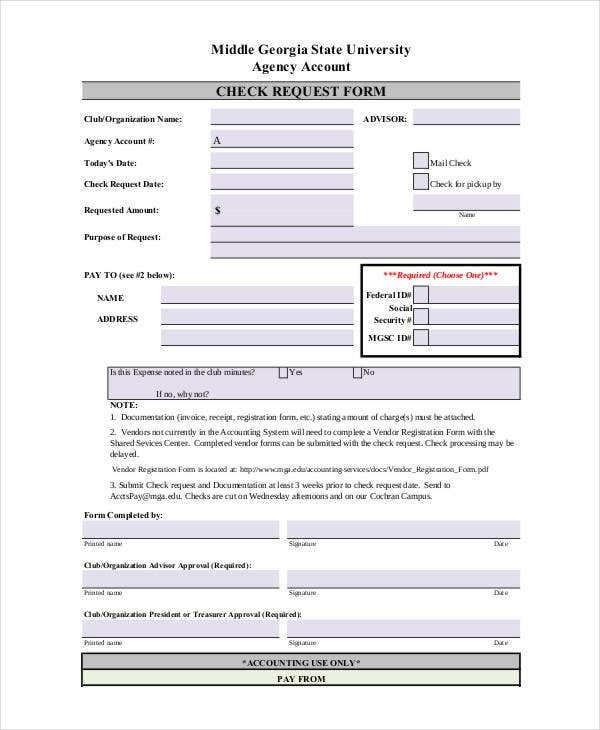 You need to fill in all the details of the form before submission and attach the original documents along with it. It is versatile and can be used for payment to any individual or agency.